It's been my great blessing to know this wondrous human being for some years now. Edna was a true warrior against injustice of every kind. She sent me a dozen privately-printed books of her really extraordinary poetry, as well as other writings "I've got things to tell the world," she says, "Important things. People need to hear'm." 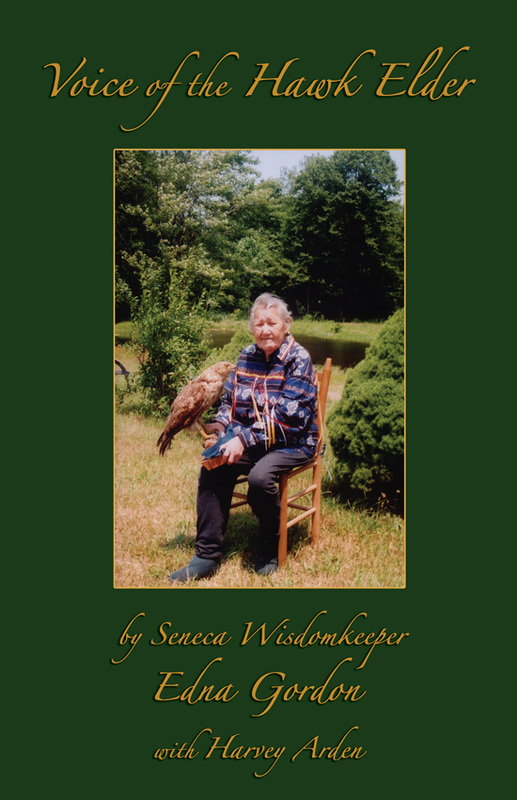 This book is dedicated to my People, the Seneca Nation, to our kindred Peoples of the Haudenoshaunee, or Six Nations Iroquois Confederacy, to all the Indian Nations of Great Turtle Island, and to all other Indigenous Peoples around this Mother Earth. I send it out like an arrow of love from my heart to YOUR hearts! YES, THIS IS MY VOICE. These are my words. My good friend Harvey has helped me sort and arrange them, like he’s done for lots of good people over the years, even back when he worked at National Geographic. He fixes my spelling and spruces up my grammar here and there, though I tell him, not too much, Harvey! I want folks to know who I am and how I really talk and what I’m really like. Don’t make me some saintly old lady come down from Heaven on a moonbeam spoutin’ high-flown words. I‘m honored Harvey’s chosen me to work with. Or am I the one did the choosing? <smile>. Harvey’s a helper, and that’s a holy thing to be. People’mselves aren’t holy. But what they do can be holy. Living a holy life, that’s what life’s for. Helping others, fighting injustice, standing up for the People—those are holy things to do. But always be sure to remember, it ain’t you yourself who’s holy. People are just people. If God’d wanted’m to be holy, he’d have given’m wings and set’m up on a cloud somewhere playin’ a big gold harp. Sounds pretty boring to me. Me, I’d rather just be a human being. I’m thankful that’s all I am or need to be. Being human, that’s a tough enough job for me.